Another day…another tag. 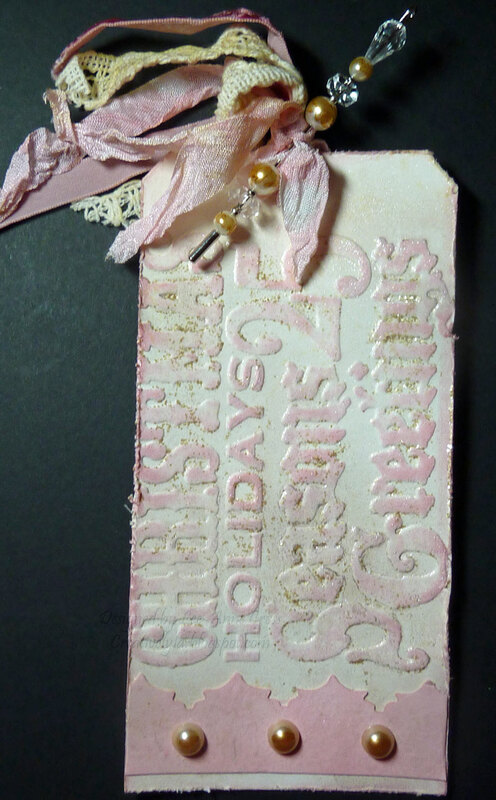 This one is based on this Tim Holtz Twelve Tags of Christmas – Day Three Tag. I’ve taken a much more feminine approach to this tag, it’s all in creams and pinks and has a whole lot of shimmer that’s again really hard to photograph. And, again, in keeping with my plan of using what I have I did not run off to Mike’s to buy something. Although I was really tempted…LOL! It all starts out with a die cut tag in ivory. Next the tag was dry embossed with one of Tim’s embossing folders. Then, the raised lettering was sanded with a sanding block and lightly touched with the Spun Sugar Distress Ink. I varied the amount of ink on the raised lettering so that some areas are darker than others. Next I took some Distress Stickles and rubbed them here and there across the raised lettering. Then hit the tag with the heat gun until they were dry. I also spritzed the card with some Glimmer Mist for even more shine. And, the edges were distressed with a distressing tool and more Spun Sugar Distress Ink. Next comes a die cut piece of the same ivory card stock. I tapped the Antique Linen Distress Ink on my non-stick craft mat and spritzed it with water before dipping the die cut in it. Then it too was spritzed with Glimmer Mist and dried with my heat gun. I used the same method to tea stain my piece of lace with the Antique Linen Distress Ink and again the same method to die a piece of white seam binding in the Spun Sugar Distress Ink. When I went looking through my pearls, I discovered that I didn’t have matching ones…some were white and some were ivory. Yes, a trip to Mike’s seemed to be in order but…Copics saved the day! I simply colored my pearls all the same color with a Copic marker. Whew! Oh, Lee-Anne, I am so inspired with this tag. And thanks for all the details..I will definitely be doing a pink tag. I love those trims, and how you made the Seasons Greetings so prominent with the pastel color. Oh and that fancy stick pin too…and the Copics on the pearls…beautiful work.